When I think I of Gospel music, two things from my childhood immediately come to mind: 1) the old-timey Gospel vinyl records my grandparents would play on their aged, multi-disc, turntable after church while preparing lunch, and 2) the Elvis and Johnny Cash Gospel records I got to know through my parent’s record collection. The Presley and Cash recordings, while both reverent, had enough rebellion and grit to them to demand my attention. Both men, Southerners, knew fire and brimstone well, and had lived on both sides of the Good Book. That duality, that friction, instantly pulled me in. It was not until a got a bit older that I really began to appreciate just how versatile, how multi-faceted these artists were. Not only did they practically invent Rock & Roll, but they also cut Country & Western records, Gospel records, Christmas records, etc., etc., and all at a furious pace; albeit, admittedly, an amphetamine driven pace. 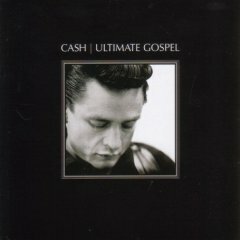 Johnny Cash’s Gospel collection rounds up twenty-four of the man’s cuts (no doubt recorded while the spirit was on him) over the years on this one disc (similar to the Elvis Ultimate Gospel collection). All but three of these tracks have been available via other albums and comps, but this single disc offers just about all the revival Cash one might ever need. I agree, keep it simple. I mean, there’s gospel music everyone can enjoy, but my preference is more toward Bluegrass Gospel, simple and down to earth. (Doyle Lawson and Quicksilver, The Isaacs, Blue Highway). Or what I call the Holy Blues, from artists like Sister Rosetta Tharp or Mahalia Jackson. I guess it may be because the artist feels they have been given a task to tell people about God, and if their talent lies in this kind of music thats why they do it!